How to enable windows authentication of IIS 7 + in Windows 7 or Vista ? No Windows authentication in IIS ? I always had a Windows 7 Laptop at my home which I never used for development purposes. Today I installed Windows 7 enterprise version on my office laptop . I created a website and wanted to set the authentication to Windows . Surprisingly I could see only anonymous authentication which is enabled by default. I remember sometime back I was modifying application host config file to play with windows Authentication settings on IIS 7.x . The configurations of IIS 7 + is not as simple and straight forward as it used to be in IIS 6 and lower version ( Probably Microsoft wanted the IIS admin to be a Geek :) ). 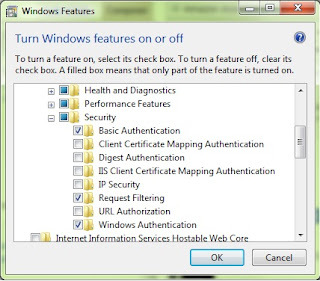 So How do we enable Windows authentication in IIS 7 for windows 7 or Vista ? Now Navigate to Internet Information services --> World wide Web Services --> Security and there you should be able to see different kinds of authentications in a dialog window, just as shown in the figure below. Now you can choose the type of authentication you want to be enabled on your IIS 7.x server. If it is Windows authentication , please select windows authentication or if it is Basic authentication , select Basic authentication based on your need. Click Ok after selection and let windows handle it. Now close / Restart your IIS and you should be able to see the chosen authentication types in your IIS as below.